SHAPE OF DESPAIR - MONOTONY FIELDS (CD) | Online Shop | Wizard LTD.
Finland’s SHAPE OF DESPAIR return to teach a magnificent lecture in melancholy with their fourth full-length. The doomsters have taken their time to create this masterpiece – worthy of their supinely paced genre, which can best be described as a carefully crafted balancing act between atmospheric and funeral doom. 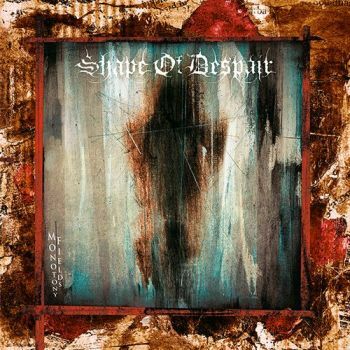 Nearly eleven years have passed since SHAPE OF DESPAIR released their acclaimed previous album &apos;Illusion&apos;s Play&apos; (2004). This hiatus was only briefly interrupted by the &apos;Written In My Scars&apos; EP in 2010 and a split 7” with BEFORE THE RAIN the following year, as strong reminders of the band&apos;s effusive talent. Having added the corrosive and grinding vocals of Henri Koivula which contrast perfectly with Natalie Koskinen&apos;s aerial female voice, SHAPE OF DESAPIR are back to reclaim the throne of funeral doom with an album that exceeds each and every high expectation their eagerly waiting fan-base has heaped upon them during their long years of absence. &apos;Monotony Fields&apos; is bound to storm the end of the year lists and still manages to appeal beyond any boundaries inflicted by its genre.